Been taking a little break lately to get prepared for the holidays. I can happily report that Christmas shopping is done, 95% wrapped, parties have been attended and the halls have been decked! Sporting a pose with my candy land themes Christmas tree! 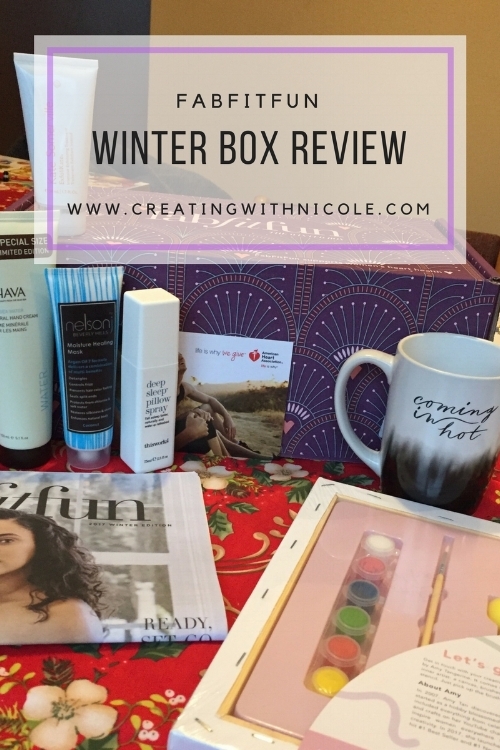 During this time my Winter box from FabFitFun arrived. The socks are very soft and comfy, the aloe definitely makes them smooth and almost moist (but in a good way?) great for curling up on the couch to watch a movie. The poncho is thin.. Not overly soft or comfortable. This was incredibly disappointing because this was the product I was looking forward to the most. It came with 8 vibrant shades and are refillable. The necklace is cute and shiny.. But I would never spend $60 on it... There's no stamp on it indicating the material so it's not sterling silver, probably a coated stainless steel. After the day ends it gets uncomfortable, and it's currently sitting in my basement where I happened to be when I shedded it. Next up is the ceramic mug: it's large which is great for coffee! And the saying is cute (and also a great disclosure). I will use this... It's a mug I have no other comments. The deep sleep pillow spray intrigued me.. Sadly I wasn't able to pronounce any of the ingredients that are in it and it's not an overly attractive smell for my pillow. The exfoliating face cream stinks... It's only meant to be used once a week so I haven't seen any benefit from it yet.. So.. So far it just stinks. Lastly, the hair repairing cream. It's only meant to be used once a week as well so I haven't seen any benefit from it yet, but it's leave in cream which should be beneficial for the abuse I've put my hair through lately. Along with the items in the box you can also get add-ons that will be shipped for free (or included in the shipping price- however you want to look at it.) so I got the art set for around $9USD. It's very sweet, and it comes with paint, stencils, and a canvas. It'll be great for a winter weekend activity. I've unsubscribed to this box... Out of 10 items that arrived at my door, I liked about half of them which barely makes it worth it considering the shipping costs and exchange rate. It's fun getting a box every few months full of goodies but I'm not really into having a bunch of beauty products hoarded in my house that have no practical purpose. I'd consider re- subscribing if they ever develop a warehouse in Canada. Until then, I'm taking a bow FabFitFun, your box lacked luster. A couple of my coworkers have been getting this box for a little while so I decided to give it a try! Essentially it's not like other subscription boxes, it gets sent to you every season as opposed to every month aaaand ... it's $50 USD BUT you receive $150-$200 worth of products. I managed to get a promo code for my starter box which made it $20 USD for the first box. After a long week my starter box arrived! ... With $14 in handling charges at the post office... That was a bit of a surprise but we are still within a good deal for the product value I've received so I stayed optimistic. The box included $146USD in products. - A foldover Clutch in ... Burgundy? - An exfoliating sponge with soap infused. - Promo codes and coupons for a few other companies. The clutch came in black, I mean the colour doesn't really matter but why mention a colour in the description at all if there's multiple colours... And it's kinda weird. I don't know what I will end up using this for. This is pending a useful use. EDIT: I've realized this bag is the same size as my laptop. I now have a laptop bag. The sponge I think is my favorite, the scent is nice and it works well. It's not overly abrasive but exfoliates nicely and it seems to hold it's soap well. This is useful. The face mist initially confused me... The words out of my mouth were literally "what does this do" I gave it the benefit of the doubt and tried it a couple of nights and it does make my face look nice? I'm still confused over what it does but it works. 2 out of 4 products I found useful. On top of the price I'm less than impressed with this box. I'm going to give it one more delivery and if I'm still not convinced I'll be cancelling. There was also a couple of promotional coupons in the box that I plan to investigate more. FanFitFun gets 2.5 our of 5.